We offer an incredibly affordable, high quality web design and build service. Including the initial meeting, design, SEO, domain and hosting, we don’t think our offering can be beaten elsewhere locally. We also believe we are different from most other web companies in that we like to deal face-to-face with our clients from day one. In our experience, clients like to meet their Web Designer/Developer and have the process explained to them in a way they can understand. Some web companies over-complicate web design and SEO for their clients. We just tell it how it is. Following an initial consultation, we will then design and build your site to your exact specification. We will ask you some questions about how you want your site to look, what type of features you require and what business goals you have for your website. We then go away and create a first draft and come back to you with the results. You can then see the site working in a development stage and we adapt it from there. By using both WordPress and Magento to develop websites, we specialise in the two largest, most popular content management systems in the world. Both WordPress and Magento offer first rate content management systems which make it easy for you to make changes to your site once it is up and running. It makes it easy to add new content, to engage your users and optimise your site with good search engine optimisation. WordPress is the worlds number one content management system, which offers the perfect platform to build stunning websites with flexibility and long-term ease-of-use. Perfect for ecommerce websites, Magento offers the most powerful set of ecommerce tools and allows good developers to build incredibly successful ecommerce sites. We offer a range of website packages to suit the needs of all types of businesses and organisations. Our packages are flexible, and the prices below are not set in stone, so please use them as a guide. All of our packages can be adapted, upgraded or downgraded according to your specific needs. A website won’t last forever. The World Wide Web is constantly evolving, so it is essential that you keep your website up to date. Out of date websites will not only fall behind the competition, but they will become slow, clunky and will lose the interest of your visitors. 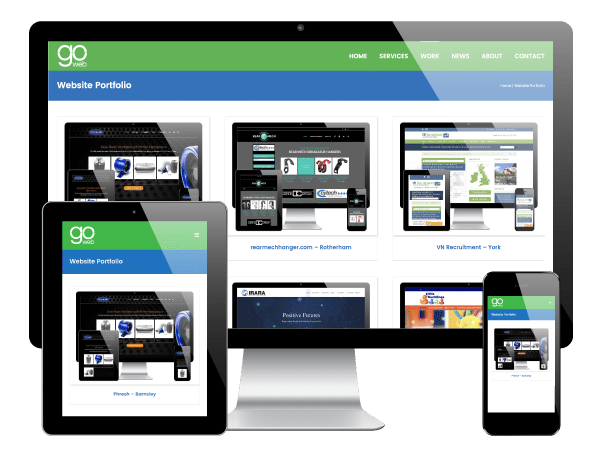 At Go Web we offer an all-inclusive, monthly website management service to ensure that your website stays up to date and meets current web standards. We offer this on a per-client basis, depending on your needs, so please contact us for further information. Ideal for businesses/organisations that want a more feature-rich and interactive website. A great way to start selling online, with all the features you would expect from a shopping site. Brilliant for businesses that would like us to work to a more detailed, specific brief of requirements.